Type Stats and Filter. 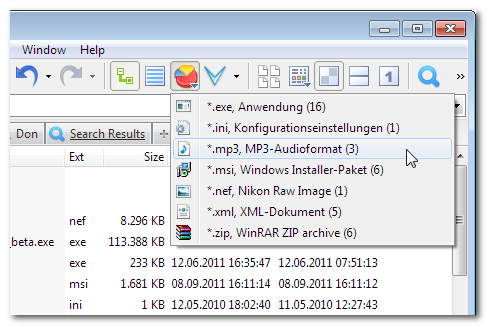 Pops a menu of all file types contained in the current folder or search results, ordered by count. Click any of the types to filter the list by this type. Killer feature. The command is located in menu	View | Tab. There is a toolbar button available with the same name and functionality. You can modify the sort order of the popup menu via right-clicking the button. There are two options, Sort by Count and Sort by Extension. Credits for the icon go to http://www.fatcow.com/free-icons. Apart from serving as a quick filter, the dropdown shows you which file types are contained in the list and the counts of each type. Works as well in branch view and search results. Straight-forward to use, powerful, and clean. 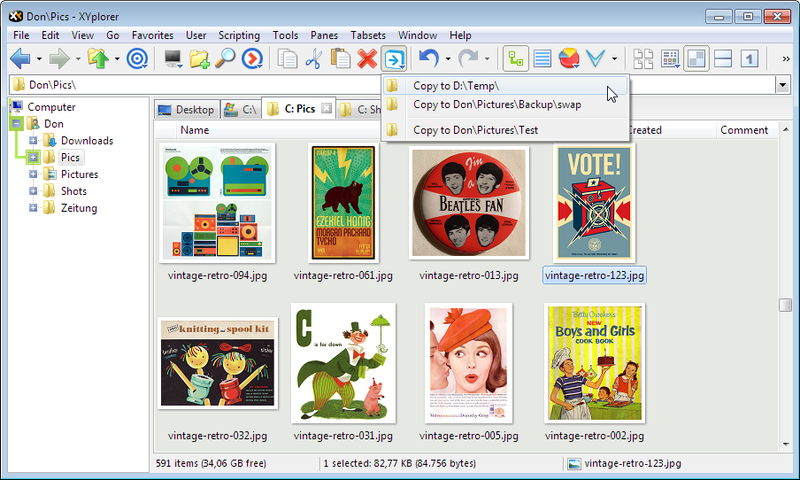 Type Stats and Select: Additionally you can use the menu to select or unselect files by type. When clicking a menu item hold CTRL to add all files of this type to the selection; hold SHIFT to remove all files of this type from the selection. Recent File Operations. Pops a menu by which you can apply recent file operations (Copy and Move) to the currently selected files, using the same operation and target path as recently. The command is located in menu	Edit, and Alt+F7 is assigned to it as default keyboard shortcut. There is a toolbar button available with the same name and functionality. Credits for the icon go to http://www.doublejdesign.co.uk. The menu also offers other operations that were previously done from this location, and, in the second section, operations that were previously done from elsewhere. 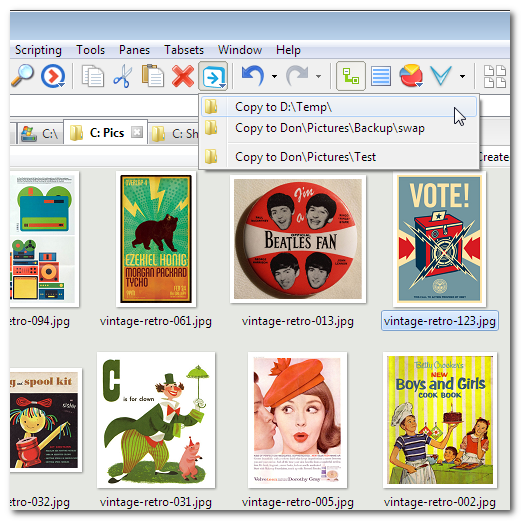 Tip: Hold CTRL to go to the selected target path (instead of repeating the file operation). XYplorer 12.30.0100 has been released on 20-Mar-2013. It just has some minor bug fixes and enhancements. XYplorer 12.30.0200 has been released on 17-Apr-2013. It just has some minor bug fixes and enhancements.